Are Dentures Right for My Teeth? If you’re missing any, most, or all of your natural teeth, then a new denture might be a good option for you. Teeth are vital to your overall health and perform functions other than providing you with a beautiful smile. Your teeth help to maintain the structural integrity of your jaw and they are responsible for chewing your food properly. When properly maintained, a set of quality, affordable dentures can last for decades, so they are an excellent investment in your health. Dentures are available in a variety of styles. Your dentist will help you match the best style option to your personal preference so that you’re happy with your new teeth. A full denture set will replace all of your natural teeth, so if you have many teeth that are missing or diseased, or if you just want new teeth, this might be an excellent option for you. Your dentist will make impressions and take measurements of your teeth and gums, so that your new dentures are an accurate replication of your bite. Any existing teeth will be removed, implants will be installed as applicable, and then you’ll receive a temporary dental appliance. When your gums have completely healed, your new teeth will be installed and adjusted so that they fit comfortably and work well. A removable full denture will rest on your gums and will need to be removed each night and cleaned. A fixed full denture will be secured by the implants that were installed and it will not require nightly removal. Is a Partial Better for Me? A partial denture will enable you to keep your healthy, natural teeth. If you’re missing only a few teeth, this might be the solution for you. A partial denture is similar to a bridge except a bridge is permanently installed whereas a partial needs to be removed and cleaned nightly. Is a Flexible Partial Denture Better? Some wearers prefer the comfort of a flexible partial denture, which is made of a lightweight, pliable material that moves as your mouth does. The clasps are made of the same pliable material and both denture and clasps are the color of your gums, so they look more like your natural teeth. An implant-supported denture is typically only placed only on the lower jaw and is held in place by dental implants. It’s a removable device rather than a permanent appliance, so it will need to be removed and cleaned daily. Do I Need All-on-Four Dentures? An All-on-Four denture is a full set of artificial teeth that are permanently implanted onto the lower jaw using four implants. They’re affixed to the dental implants that were installed and combine the convenience of a fixed denture with additional biting power. What Steps Are Involved in Getting New Dentures? Several steps are involved when getting affordable quality dentures, and will vary according to the individual. Your dentist will take measurements and impressions of your teeth and gums so that your new denture fits well. The condition of your oral health, the amount of work needed, the options you select for your dentures, and the materials needed to make them will all affect the final cost of getting your new dentures in Springfield. The cost of your new dentures will depend on several factors, such as the type of denture you select, your oral health, the amount of work to be done, and the material needed to make your new denture set. 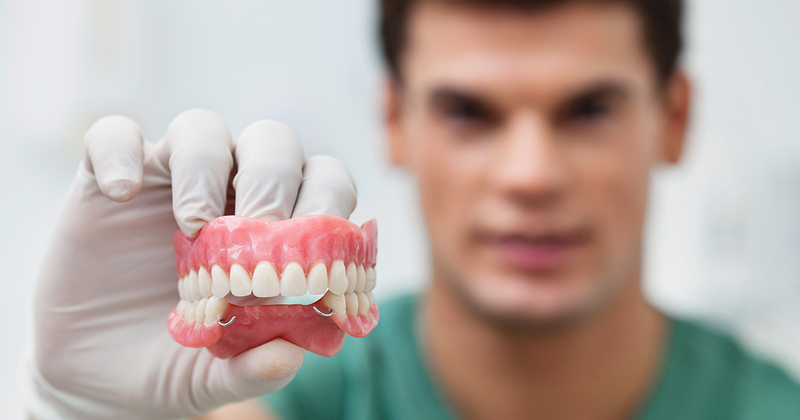 Traditional dentures are made of a hard acrylic material that some wearers find uncomfortable. A soft reline lines the denture with a pliable material that patients generally find more comfortable and eliminates sore spots and discomfort that some wearers experience. If you want to get new dentures in Springfield, call us today and we’ll find affordable quality dentures for you. We can answer any additional questions you may have about the process, so call us today.